Shoji Nishio Sensei was born in Aomori Prefecture in 1927. 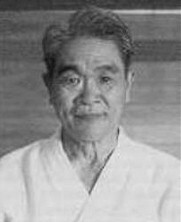 He entered the Aikikai Hombu Dojo at the end of 1955. He practiced judo, karate, iaido, and jodo prior to beginning in aikido. The skills he acquired through his practice of these martial arts are incorporated seamlessly into his unique aikido. Nishio Sensei made regular trips abroad to Scandinavia, Europe and the U.S.A. - A.J. 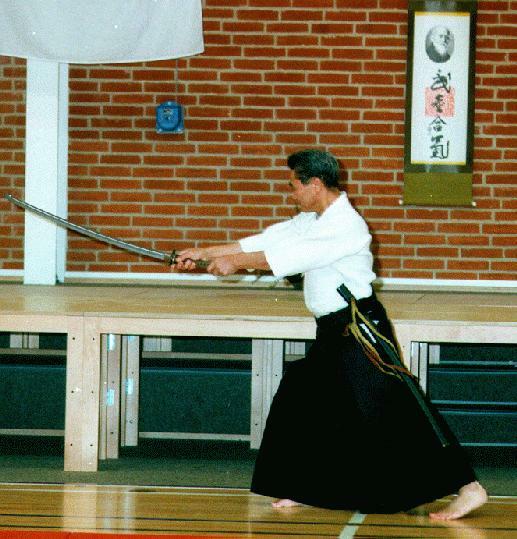 Shoji Nishio Sensei is an 8th dan Shihan, Aikikai Federation, and 7th dan Shihan in the Nihon Zendoku Iaido Federation. He also holds a 4th dan in Kodokan Judo and a 4th dan in Shindo Shizen ryu of Karatedo. He has also studied Shindo Muso ryu - Jodo(staff), and Hozoin ryu - Yari(spear). 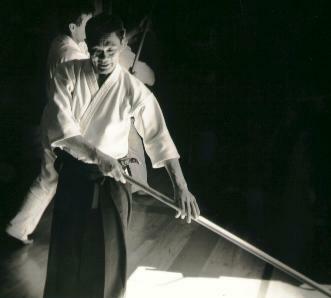 He has developed a new school of Iaido with forms based upon Aikido techniques, Aiki Toho Iaido. One must understand the difference between the nature of strength in aikido and the nature of strength in budo in general. And, I think it is also necessary to correctly interpret the meaning of the "bu" in budo. A look at the history of Japanese budo will show that it has not developed in an ideal way. Essentially, budo is a means for people to orient themselves and create focus in their lives. Unfortunately, it has tended to stray in the opposite direction, to the extent that it has come to mean only defeating or injuring others. We need to reflect on this in our pursuit of budo. To the extent that aikido is a budo, it will, of course, require a certain amount of outward, superficial strength. Unfortunately, many people in the aikido world today take advantage of the fact that there are no matches in aikido and allow themselves to neglect the budo aspect of their training. When I first began training in aikido, almost everyone in the dojo had a background in some other martial art like judo, kendo, or karate. They had all come seeking something better, something beyond what they had been doing. 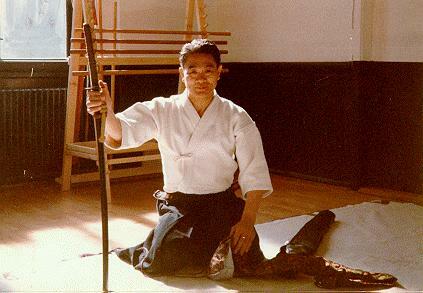 The founder's influence was very strong back then, too, which enhanced the budo atmosphere even further. People coming to train in aikido these days do not necessarily have such prior experience and this has created a vast difference between the training then and the training now. Nowadays there are many teachers who say it is unnecessary to even look at, let alone practice, other martial arts, but this is great mistake. The worth of any particular budo is determined by comparison with other budo. It doesn't really matter how skilled you are at aikido if your aikido is little more than a dance with no practical value. Some aikido instructors these days claim that training with the sword (ken) and jo is entirely unnecessary. Such claims are ridiculous; nothing could be further from the truth. O-sensei said, "Aikido is the expression of the principles of the sword through the body." Therefore, understanding aikido without first understanding the sword is quite strange. 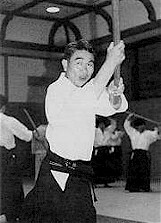 It seems to me that those who claim there are no weapons techniques in aikido have not understood the founder's words. The "bu" in budo is generally interpreted to mean "to stop the halberd of the enemy." In aikido, however, our interpretation is more like "a halberd is stooped," in other words, to stay one's own weapon. Ordinarily budo is thought of as a way to stop an enemy coming from without, but in aikido we prefer to interpret it as a way to change ourselves within. Giving some thought to the question, "What is budo?" we can come up with a variety of approaches, goals and processes that can inform the way we train. In the old days it was said that training in budo was training to overcome seemingly impossible odds. In aikido we take a different view: we acknowledge the impossibility of going against nature and do not try to overcome the impossible by force. All styles of budo are continuously struggling in their own fashion to improve. Practitioners of budo must remain aware of and understand the nature of these changes. Arts like karate, judo and kendo all have their good points and these can be used to nourish one's own budo training, taking them into account and making even greater efforts. Those who take this sort of attitude toward other budo never make disparaging comments like, "Oh, that budo" or "How can they do budo like that?" The only people who condemn other budo are those that do not practice them; such people find their activities more difficult somehow (maybe even a little threatened) when others around them are exploring such different paths. But I think their is something to be learned from any art or style one chooses to study and people who understand this will be able to make great progress. I have experience in karate and judo, and feel the way of the sword is central, so I reflect empty-hand techniques and throws in my sword and jo movements. 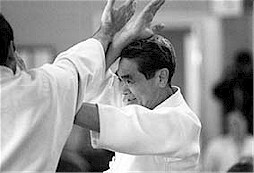 O-sensei said, "If your hands hold a sword, then aikido is a sword; if your hands hold a jo, then aikido is a jo." That's what I'm trying to reflect in my training now. To understand the nature of the sword and the nature of the spirit of aikido, we train realistically, "on the edge," as if to down the opponent in an instant the moment contact is made, but instead we stop within a hair's breadth, neither cutting the opponent nor allowing ourselves to be cut, and instead use the training as a time and place for mutual reflection and introspection. This is the process and the goal of our training. I tell my students, especially the younger ones, to try to learn as much as they can by themselves. It's easy enough for me to simply correct their mistakes, but that which they obtain through their own initiative and hard work has a different value then that which they have merely been taught or told. The process of seeking and learning itself is full of experience that will become elements of future growth. One of the meanings of the expression "extend ki," which we hear so often in aikido, is to generate this kind of seeking mind, this initiative. Real combat takes place in an instant of contact. Training with the sword and other weapons will help you understand this very clearly. When just starting to learn, people must open themselves to the fundamentals of budo, but at a certain stage they need to developed the initiative to seek out answers on their own. If that means knocking on the door of a karate or judo school or what have you, then so be it; there is certainly nothing wrong with that and in fact challenging oneself in such a way is admirable. People who find a need in themselves to study those other styles of budo, to confirm their meaning through first-hand experience, should by all means do so. Aikido must not be allowed to become just a dance. Aikido is essentially a budo and therefore must be practiced with sound understanding of the fundamental essence of budo. To be lacking any aspect - kicks, throws, sword-work, or what have you - is really to leave aikido crippled and incomplete as a budo. O-sensei, too, said that aikido can be applied in each and every area of budo.